Abdul Monsur has good reason to worry. After losing his job as a pipe welder in the United Arab Emirates (UAE) he was deported to Bangladesh. “I sold my land and borrowed almost 1.75 lakh taka (US$2,550) from my relatives to get this job,” the father-of-four, who paid more than $3,500 to a local job recruiter six months earlier to secure the job, told IRIN. “I still haven’t been able to pay off the debt,” he said. Such stories are not uncommon. Layoffs and forced repatriation of Bangladeshi workers from the Middle East and Malaysia (the two primary destinations for Bangladeshi workers) are increasing at an alarming rate. According to the Bureau of Manpower, Employment and Training, some 13,000 were sent back in the first two months of 2009. On 11 March, Malaysia decided to revoke the visas of some 55,000 Bangladeshi workers. Ghulam Mustafa, president of the Bangladesh Association of International Recruiting Agencies, expressed concern over the number of returning workers. “If this continues for long, I am afraid Bangladesh might plunge into a great economic and social crisis,” he told IRIN. He feared that the annual outflow of migrant workers might fall by nearly half in 2009 - to below 500,000 from a record high of 875,000 in 2008. 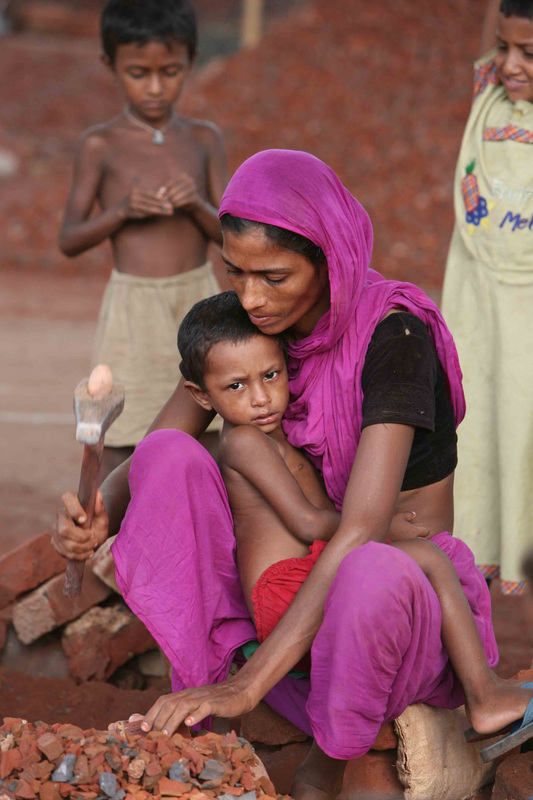 A mother and her child making bricks, Dhaka, Bangladesh, July 2007. The labour force in Dhaka grew twice as fast as in the country as a whole in the late 1990s largely due to continuing migration and increasing female participation in the labour-force. Bangladesh is the fifth highest remittance-earning country in the world. In the last fiscal year (July 2007-June 2008), remittances totalled US$10.7 billion, accounting for 10 percent of gross domestic product, according to the central bank. The sharp drop in oil prices over the past few months has affected the construction sector in places like Saudi Arabia and the UAE, causing migrant workers to be laid off. Motasim Billah, manpower consultant and owner of a recruiting agency, described the current situation as grim. “The real estate business has taken a major blow in the Middle East due to the recession. As most of the Bangladeshis work for construction companies, they are now facing the axe,” he told IRIN. The UAE hired 23,978 Bangladeshi workers last December and 25,463 in January, although over the past few years it had been hiring an average of 36,000 workers monthly. After a 10-year ban, Malaysia resumed hiring Bangladeshi workers in August 2006 and had recruited around 400,000 since then, but recently numbers have declined dramatically. Meanwhile, as concern about the returning migrant workers rises, the government is making diplomatic efforts. At a briefing at the National Press Club in Dhaka on 16 March, Foreign Minister Dipu Moni said Bangladesh had formally asked the Malaysian high commissioner in Dhaka to review its visa decision. She also said it was time to look around for new labour markets. Worldwide, around 6.2 million Bangladeshis are migrant workers. Of these about 2.2 million are employed in Saudi Arabia; one million in UAE, Kuwait and other Arab countries; and 800,000 in Malaysia. “In many developing countries, remittances provide a lifeline for the poor,” said Dilip Ratha, senior economist and co-author of the World Bank report Migration and Remittances Factbook 2008.